Lead management software helps sales teams organize and prioritize their leads with lead scoring and contact management features. We evaluated more than a dozen options and narrowed it down to the best six for 2018. To identify the best, we used the most important criteria, which include lead scoring, pricing, ease of use and organizational functionality. Lead management software helps you organize, manage, prioritize and track hundreds, even thousands of leads in one place. When considering software options that are right for small businesses, we looked for lead management solutions that were easy to set up and use, affordably priced, saves time and makes it easier to build relationships with top prospects. Based on this criteria, we have determined Freshsales to be the overall best small business software for lead management for its ability to help you organize, prioritize and work your leads, its ease of use and its affordable price point. Freshsales also has team management tools, a great mobile app and a simple to use built-in dialer making it a terrific option for territory-based sales teams or for sales organizations who need lead management while in the field. Freshsales is the best overall CRM software and lead management tool for businesses engaged in territory-based sales because it allows you to prioritize the best leads, support territory-based lead assignment and is affordably priced. What makes it unique is its mobile app, built-in phone system and territory-based lead management. Therefore, it is a good option for sales organizations want a tool that helps them manage their leads while in the field. Freshsales is affordably priced, starting at $12 per user, per month. There’s also a free version that offers basic lead and contact management functionality for unlimited users. As your needs grow and you require more advanced tools, prices are still affordable at $49 per user, per month. The Sprout plan is the free version. It offers a way to organize leads and includes an unlimited number of users and contacts. It includes basic lead management functionality like lead scoring and contact management. There is also a built-in phone, unlimited support and a mobile app, which earned Freshsales our number one spot for best mobile CRM. Compared to Insightly and Zoho free plans, Freshsales has no restrictions on the number of users. The Sprout Plan is appropriate for small businesses that want to organize their contacts and communicate with them by phone, but aren’t quite ready for paid features like lead assignments, workflows or bulk emails. Starting off with this plan will help you stay organized and will give you the ability to scale into a solution that supports a bigger more segmented sales team divided into territories. 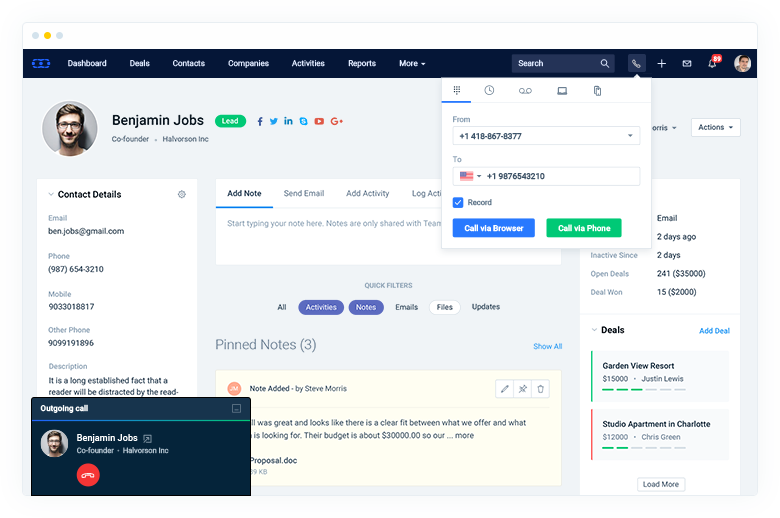 Starting at $12 per user, per month, this plan builds on the Sprout plan, providing more advanced CRM tools in addition to the lead organization and calling features. It offers pipeline creation and management, expanded lead scoring, advanced reporting and workflows and the ability to send up to 250 bulk emails. This plan is comparable to Salesmate CRM, which also offers a built-in phone system and also priced starting at $12 per user, per month. Freshsales’ Blossom plan is the best option for business owners looking to go beyond lead organization. They want lead management software combined with CRM tools to help them communicate with and convert their leads more efficiently. They’re also looking for basic reporting tools to assess the effectiveness of their activities. Starting at $29 per user, per month, this plan expands on the Blossom plan, offering territory management, lead scoring by email activity, lead assignment rules and an expanded number of automation workflows. This plan also offers call forwarding and call transfer, which support territory-based teams. This plan is similar to Insightly’s Professional plan priced at $49 per user, per month, with its workflow and lead scoring functionalities but offers calling features not available with Insightly. This plan is for small businesses that are ready to segment their sales teams into territories. A combination of territory management tools like automated lead assignments and the ability to purchase and assign either national or local phone numbers to sales reps, combined with call transfer and call forwarding allows teams to engage with leads assigned to them quickly. The Estate plan starting price is $49 per user, per month. It offers expanded sales campaign and lead scoring capabilities. It also offers web-to-lead capture forms, additional sales campaigns and additional workflows. However, this tier lacks some of the more advanced tools offered by the other providers at this tier. For instance, Pipedrive offers multiple dashboards and revenue forecasting while Insightly focuses on workflow automation and custom dashboards. The Estate plan is great for businesses with territory-based sales teams interested in expanding their prospecting and lead generation activities in a more strategic way. The features in this plan allow you to use lead scoring to focus on the best leads, automation tools to capture website leads and sales campaigns to target and communicate with the best prospects. Freshsales makes it easier to establish and manage territory-based teams in a lead management system. Freshsales is missing project management tools to help you engage with new customers once deals are closed. If project management tools are important, you can always use a tool like Trello which has an upcoming integration with Freshsales. Freshsales users love the software because they find it easy to use, get great support and includes email and phone integration. Any dislikes fall under the category of minor glitches or that the system can sometimes be slow. For more information on reviews, see our article, Freshsales CRM User Reviews, Pricing & Popular Alternatives. Territory-based teams are more focused and efficient with lead assignment and scoring tools. They become even more productive with built-in phone and email tools to communicate with top prospects. Visit Freshsales today to try these tools yourself by signing up for a 30-day free trial. Pipedrive is the best lead management software for small businesses that want an affordably priced visual snapshot of their lead stages and activities. It includes a Kanban-style lead management tool and detailed at-a-glance contact insights as well as customizable dashboards and sales forecasting reports. This makes it a terrific option for teams looking for a simple to use and highly visual lead and pipeline management solution. Pipedrive is affordably priced, starting at $12.50 per user, per month. As your needs grow and you require more advanced tools like revenue reporting and multiple dashboards, prices are still affordable at $49.17 per user, per month. The Silver plan, priced at $12.50 per user, per month offers a basic set of lead management features including lead capture web forms, activity schedulers and activity reminders. It also includes a calendar and the ability to copy emails into pipelines. It’s pricing and robustness are similar to Zoho and Freshsales’ starter plans. It has less sophisticated features like fully integrated email than the Gold and Platinum plans. For small businesses looking for a robust entry-level lead management tool in the $12 to $15 range, the Silver plan is a great choice. When it comes to email communication, it is a great option for businesses that want to link their prospects with email communications but don’t send enough emails to warrant full email integration. The Gold plan contains everything in the Silver plan but offers fully integrated email where emails can be sent and received directly in Pipedrive. With email integration, open and click rates are tracked, which contributes to lead management by providing information that influences prospect engagement. This plan also offers a customizable dashboard, workflow automation and event scheduling. Pipedrive’s Gold plan is the best option for business owners looking to go beyond the basics for the cost of $24.20 per user, per month. It is best for teams looking for lead management software that will give them insights about the effectiveness of their communications and help them automate and schedule tasks, so they become more efficient and productive. In addition to everything the Gold plan offers, the Platinum plan includes single sign-on, multiple dashboards, the ability to create teams and revenue forecasting reports. It is priced starting at $49.17 per user, per month, which is comparable to Insightly and Freshsales plans at this tier. The features in the Platinum plan are best for companies with larger sales teams because they streamline lead management and follow-up activities and save business owners, sales managers and salespeople time. For instance, the single sign-on feature decreases onboarding time by eliminating the need to create multiple new accounts every time a salesperson joins the company. Pipedrive’s visual pipelines make it easier to identify leads that require action quickly. Unlike Freshsales, Pipedrive is missing a built-in phone system which allows salespeople to take immediate action on their leads. It’s also missing lead scoring and assignment capabilities. Pipedrive is also missing phone support at its lower-tiered plans, which can be important for some salespeople and business owners. Pipedrive users love that it is easy to use, highly customizable for their needs and very visual. They also love its mobile app which allows for productivity on the go. Pipedrive hasn’t received a lot of negative reviews, but when they do, they tend to be about minor bugs. For more information on user reviews, see our article Pipedrive User Reviews, Pricing & Popular Alternatives. Businesses that want to save time by getting lead management information visually and by using sales activity prompts to engage in the right activities with their prospects should consider Pipedrive. Best of all, you can try for free, by signing up today for a free trial today. 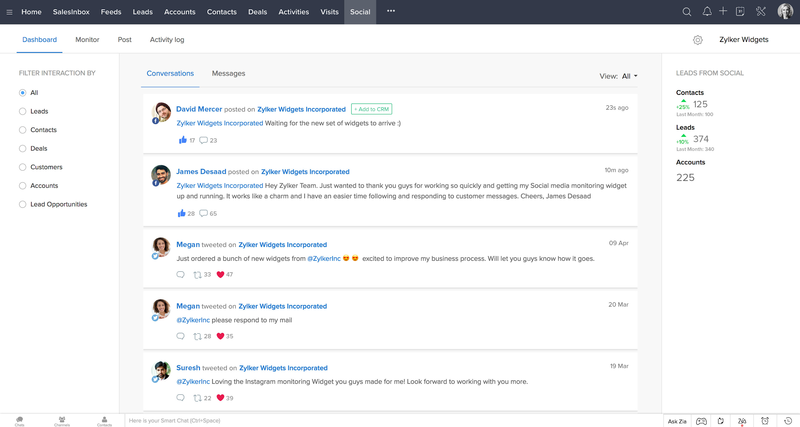 Insightly is a CRM with lead management as well as project management. It also includes helpful automation features like its unique built-in business card scanner as well as email templates, web-to-lead forms and automated lead assignment rules. It is best for businesses that want to automate their lead management or plan to build long-term relationships with their leads beyond the initial sales cycle. Insightly is affordably priced, starting at $29 per user, per month. As your needs grow and you require more advanced tools like workflow automation and role-based permissions, prices are still affordable at $49 per user, per month. The Free plan offers the same core set of task, lead, relationship and project management functionality as the paid plans. Where it differs is that only two users are allowed on this plan, and there are many limitations like a limited number of records that can be imported and size of data storage. It is comparable to the free versions of Zoho and Freshsales but, unlike these two options, it offers project management tools to help foster long-term relationships. For small businesses with only one or two users looking to try lead management software and plan to manage projects and pursue long-term relationships with their customers, the Free Plan is the best choice of the six options featured in this article. It’s a great starter option that is scalable when the business expands its team and level of prospecting and lead management. The Plus plan offers the features of the free plan and also has some additional ones. The main difference is that there are not as many limitations or restrictions. The $29 per month, per year or $35 per month, per month basis price is for each user. Record, storage and email limitations are significantly increased. This plan also includes features like the business card scanner and Google Contacts and Calendar Sync. Insightly’s Plus plan is the best option for business owners looking to go beyond the Free Plan. Their number of leads and number of users have increased creating the need for more features like email scheduling and Google Contacts and Calendar syncs. They also need fewer restrictions on the number of records and storage. The Professional Plan offers fewer restrictions in terms of a number of records and data storage while offering tools and resources not available on the Free and Plus plans like workflow automation and lead assignments. Workflow automation can automate lead management tasks and lead assignments can ensure the right leads go to the right sales rep. This plan is best for businesses with medium to large sales teams that may be segmented by territory or product. 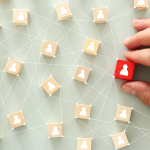 Tools like lead assignments, role or profile permissions and workflow automation help managers better direct and manage their team’s sales activities. Expanded email capabilities such as the number of mass emails and email templates can also add to team productivity all for an affordable price of $49 per user, per month. Insightly’s task and project management tools make it easy to communicate with prospects that have become new customers. Insightly is missing free phone support and in-depth training. It offers email support, but for users who prefer to speak to someone, they’d have to buy a Customer Success Program. Also missing is call integration, which would complement email integration, where calls can be made, received and tracked right in the software. If this feature is important, Freshsales or Salesmate are better options. Insightly users love the project management features. They like the fact that they can stay involved with customers even after a deal is closed. They love how it helps organize contacts and track opportunities. They think Insightly can improve on training and onboarding. For more information on Insightly user reviews, see our article, Insightly User Reviews, Pricing & Popular Alternatives. If your business could benefit from a CRM with robust lead management and project management tools, consider Insightly. Insightly gives businesses tools to help build long-term relationships with their leads by helping them stay on top of tasks beyond the initial sale. You can sign up for an Insightly free trial to see if it’s right for you. Zoho is a CRM with lead management tools that allow businesses to capture leads directly from social media. Zoho also offers advanced features like artificial intelligence powered sales signals that can help businesses focus on their lead development efforts on the most engaged social media prospects. Therefore it is best for businesses that want to manage their social media leads as well as their leads from more traditional sources. Add Zoho is affordably priced, offering a free option for lead management. Paid plans start at $12 per user, per month, with an annual agreement or $18 per user, per month for a month-to-month agreement. Even at the Professional level, the pricing is very competitive at $20 per user, per month, with the annual agreement. The Free plan offers basic lead management features such as being able to organize and store leads, accounts and opportunities. 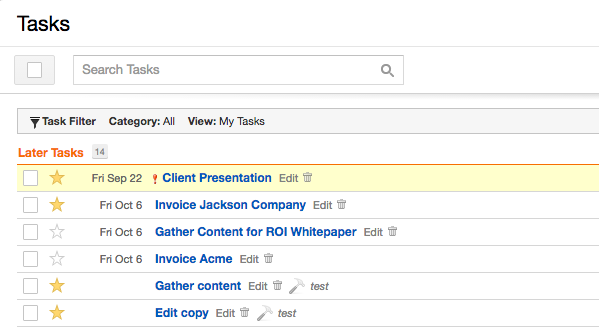 You’re also able to track tasks, events, call logs and notes as related to your leads. It also includes basic workflow management tools like workflow rules and email notifications. Even with the Free plan, users can take advantage of basic social media integration which differentiates Zoho from competitors. The Free Plan is appropriate for small businesses with three users or less that want to manage their leads and engage them on social media. It allows you to share content, have conversations and follow posts from your prospects. It’s a great starter plan to organize your leads and execute a social media engagement strategy that will support moving your prospects along your pipeline stages. The Standard plan builds on the Free plan, with advanced marketing tools like mass emails, marketing campaigns and social media lead capture forms. You can also integrate calling features with Zoho Phonebridge. These features help build prospect relationships while supporting lead generation from social media and higher levels of engagement over the phone. The Standard plan is the best option for business owners looking to execute marketing and lead generation campaigns alongside their prospect nurturing activities. Pricing is comparable to Freshsales, which also has a built-in phone at $12 per user, per month. The Professional plan, priced at $20 per user, per month builds on the Standard plan and adds more advanced tools like inventory management and Zoho Finance Suite. These tools add to the level of engagement by giving the salesperson access to information on products, inventory, invoices and more while they are communicating with their prospects or customers. This plan is for small businesses that want to access and incorporate product information while engaging their prospects and customers. This can save time that the salesperson would have to take to log into another system to access information. 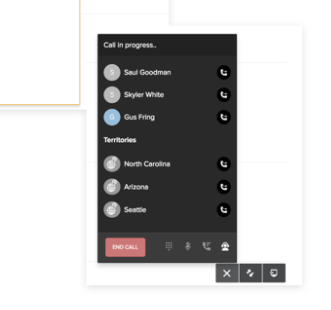 Zoho is missing the Kanban-style visual lead management tools found in Freshsales and Pipedrive and, while it has a phone dialer integration, it is not offered as a built-in feature. It also lacks the project management found in Insightly, though this too can be added and integrated into the software. Therefore, Zoho is not as out-of-the-box ready as the other products we compared in terms of lead management. Zoho users like the fact that the software is very comprehensive. However, some are disappointed with having to buy add-on products to get the functionality they are seeking. For more information on reviews, see our article, Zoho User Reviews, Pricing & Popular Alternatives. Zoho allows users to engage with prospects through social media. If you’d like to try integrating your social media initiatives with your lead management and CRM software, sign-up for a free trial with Zoho today. You can also sign up for its free plan which accommodates up to three users. Less Annoying CRM is a CRM and lead management software program for businesses that value simplicity. Less Annoying CRM provides the users with a way to manage the most important information their leads without having to navigate through extra features. Its simplicity and below industry average price point, therefore, makes Less Annoying CRM best for businesses with limited resources and looking for a no-frills lead management solution. This is perhaps the most affordable and simple paid lead management system, at a low cost of $10 per user, per month for unlimited users. There are no pricing tiers, product limitations or contracts. It also offers a 30-day free trial so that you can try out the software before buying it. Less Annoying CRM offers the essential features needed to keep leads and deals organized, like contact management features that allow you to access contact details as well as notes, activities, meetings and pipeline information easily. It is not as sophisticated Insightly or Freshsales with functionality like lead scoring or a built-in phone, but it offers enough to stay organized and focused on converting your leads into paying customers. Less Annoying CRM also offers a lead report. 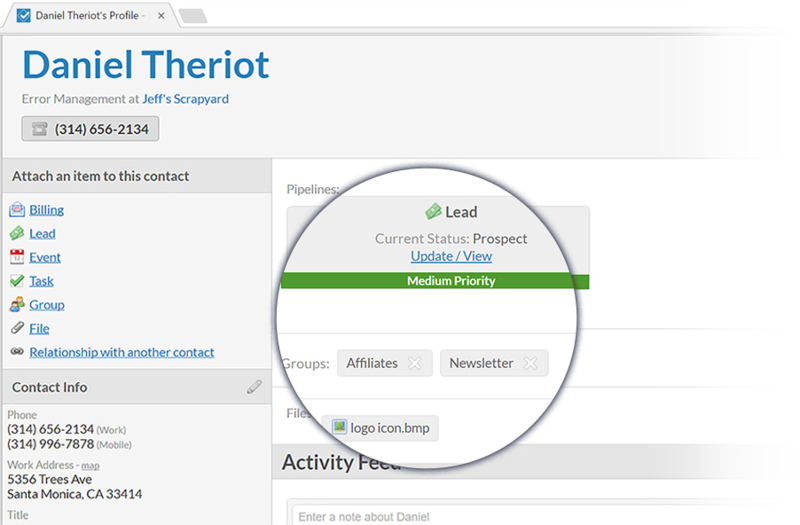 This report generates a list of the contacts in your pipelines and information you need to take action such as lead priority, lead status and any notes you’ve taken from your interactions with your leads. It gives you a high-level summary of what you need to do next to move your opportunities forward. Other providers, such as Insightly, allow you to create reports on your leads, but Less Annoying creates it for you. The contact management features allow you to view your contacts along with any related tasks, events, files, notes and pipeline information all in one screen. This gives you a snapshot of everything related to your contacts and the actions you need to take to move your deals forward. This feature is comparable to features of the other providers highlighted. The BCC Email Sync feature allows you to sync your leads with emails you exchange with them. This is important so that you can reference emails while on the phone or creating a follow-up email to move a deal along. This feature, which is comparable to similar features offered by the other five providers, syncs emails to contacts when you bcc an email box from Less Annoying CRM. Less Annoying CRM has a built-in calendar, which syncs with Google calendar for easy access and reminders of due dates. However, Less Annoying CRM lacks many of the more robust workflow automation and follow-up rules found in other programs like Freshsales, Pipedrive or Insightly. Based on your upcoming events, tasks and activities as related to your leads, the daily agenda emails feature sends an automated email every day listing all of your tasks for that day. This helps you stay on top of the things you need to do daily to move your opportunities closer to being closed deals. Because this is an email, you don’t have to log into the system to view the things you need to do. This is a unique feature of Less Annoying CRM. Less Annoying CRM’s simple and easy to use platform allows you to focus on managing and working your leads. Less Annoying CRM is a no-frills lead management solution. Therefore, it is missing many of the more advanced features found in the other products we compared like project management, advanced dashboards and automated lead routing. It also lacks the email integration and lead capture tools that Freshsales, Insightly, Salesmate and Zoho offer. Users really like Less Annoying CRM because it is easy to use, affordable and has a simple pricing structure. They also love their customer support which is via email and phone. There are very few things people seem to dislike. Some negative reviews center around having a more appealing user interface. For more information on reviews of this product, read our article, Less Annoying CRM User Reviews, Pricing & Popular Alternatives. Less Annoying CRM includes helpful tools for organizing and managing your leads without a lot of extra features you don’t need. If you’re looking for a no-frills, affordably priced lead management and CRM, Less Annoying offers a 30-day free trial. Sign-up today to get started. Salesmate CRM is the best lead management and CRM software with robust calling features. In addition to features like built-in virtual phone system and text message tracking, it also includes two-way email integration and automation. It is, therefore, best for businesses that depend on calling as part of their lead development and outreach strategy. Salesmate CRM is only $12 per user, per month, billed annually or $15 per user, per month, billed monthly and is one of the most affordable advanced lead management systems. There are no pricing tiers, product limitations or contracts. It also offers a 15-day free trial and offers virtual phone numbers billed only by minutes used. Salesmate CRM offers essential and advanced features small businesses need to keep their leads and their deals organized. Key features include built-in virtual phone and text messaging, integrated email and workflow automation. What makes Salesmate different from Freshsales and Zoho is that text messaging features are fully integrated into the platform. To get this functionality in Freshsales or Zoho, you’d need to use additional apps. 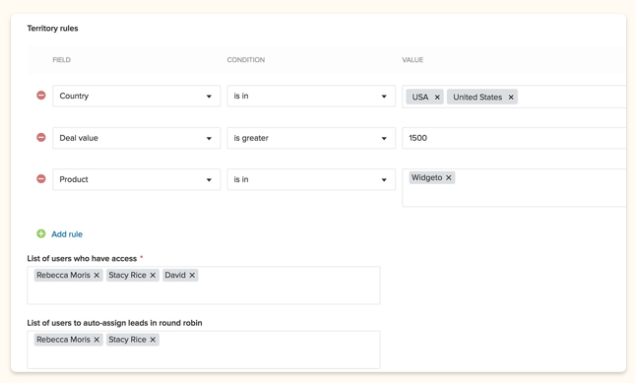 Salesmate CRM organizes leads in a Kanban-style format similar to Freshsales and Pipedrive and gives users the ability to sort and filter leads by categories, pipeline stage or lead age. It also includes a dashboard-style report that makes it easy to see where there are bottlenecks in your process through the use of color-coded bar charts. Salesmate CRM consolidates contact details onto a single page allowing businesses to see information related to their prospect’s needs at a glance. Specific activities like phone calls and text messages related to an individual contact are then arranged in a timeline format similar to what is found in other lead management systems like Freshsales and Pipedrive. However, Salesmate CRM also offers integration with Slack. This lead management software also includes integrated email where emails can be sent and received from within the tool. Other email tools include email tracking where open rates and click-through rates are tracked. Email templates are also included to help the salespeople save time. Smart BCC is also included to ensure emails are linked to the right contacts. With Salesmate CRM, you have the ability to make and receive calls and text messages right inside of the software. Calls can be placed from either a laptop or smart device. You also have the ability to choose a national or local phone number for your sales teams. Because the phone system is built-in, you have the ability to generate call logs to track your calling activities, just as you could in Freshsales and Zoho. Salesmate CRM includes unique call reports, which cover metrics like the number of calls users make, total talk time and call outcome, in addition to more common reports like sales forecasts found in other CRMs. There is also an individual dashboard that shows real-time performance vs. their periodic sales goals and a sales leaderboard showing how each individual rep compares against other team members. Salesmate CRM integrates calling and text messaging within their lead management software. Salesmate CRM is missing project management tools to help expand the relationship beyond the point where the deal closes and Kanban-style visual lead management. Another feature it’s missing is lead scoring. Being able to score and rank leads is critical to lead management because you know which leads to work first. Lead scoring is possible with an app integration. However, it is easier when the functionality is built-in. If the prospects in your industry communicate by phone and text and you’d like to see how Salesmate CRM’s phone and text messaging capabilities can benefit you, sign-up today for a 15-day free trial. The best lead management software is easy to use, affordable and has all the tools you need to organize, prioritize and work your leads. Whether you are looking for simplicity, a highly visual lead management tool, the ability to establish and grow long-term relationships or have a sales team you are planning to divide by territories, one of these six solutions will meet your needs. Being able to quickly take action on your top leads by making or answering phone calls and carrying out other sales activities can mean the difference between winning and losing a sale. Freshsales lead management and CRM software helps business owners take meaningful action, track results and change direction if necessary. Give Freshsales a try by signing up for a free trial.